Buddha's Birthday is a holiday traditionally celebrated in Mahayana Buddhism to commemorate the birth of the Prince Siddhartha Gautama, later the Gautama Buddha and founder of Buddhism. According to the Theravada Tripitaka scriptures (from Pali, meaning "three baskets"), Gautama was born in Lumbini in modern-day Nepal, around the year 563 BCE, and raised in Kapilavastu. The exact date of Buddha's Birthday is based on the Asian lunisolar calendars and is primarily celebrated in Baisakh month of the Buddhist calendar and the Bikram Sambat Hindu calendar, and hence it is also called Vesak. In Nepal, the birth-country of Buddha, it is celebrated on the full moon day of the Vaisakha month of the Buddhist calendar. In Theravada countries following the Buddhist calendar, it falls on a full moon Uposatha day, typically in the 5th or 6th lunar month. In China and Korea, it is celebrated on the eighth day of the fourth month in the Chinese lunar calendar. The date varies from year to year in the Western Gregorian calendar, but usually falls in April or May. In leap years it may be celebrated in June. In Nepal and neighboring South Asian and Southeast Asian countries, Buddha's birthday is celebrated on the full moon day of the Vaisakha month of the Buddhist calendar and the Hindu calendar, which usually falls in April or May month of the Western Gregorian calendar. The festival is known as Buddha Purnima, as Purnima means full moon day in Sanskrit. It is also called is Buddha Jayanti, with Jayanti meaning birthday in Nepali and Hindi. In many East Asian countries Buddha's Birth is celebrated on the 8th day of the 4th month in the Chinese lunar calendar (in Japan since 1873 on April 8 of the Gregorian calendar), and the day is an official holiday in Hong Kong, Macau, and South Korea. The date falls from the end of April to the end of May in the Gregorian calendar. In 1999 the Taiwanese government set Buddha's birthday as the second Sunday of May, the same date as Mother's Day. As a result of the Meiji Restoration, Japan adopted the Gregorian calendar in lieu of the Chinese lunar calendar in 1873. Therefore, in most Japanese temples, Buddha's birth is celebrated on the Gregorian calendar date April 8; only a few celebrate it on the orthodox Chinese calendar date of the eighth day of the fourth lunisolar month. In Cambodia, Buddha's birthday known as Visak Bochea is a public holiday and monks around the country carry flags, lotus flowers, incense and candles to acknowledge Vesak. People also take part in alms giving to the monks. In China, celebrations often occur in Buddhist temples where people light incense and bring food offerings for the monks. In Hong Kong, Buddha's birthday is a public holiday. Lanterns are lit to symbolise the Buddha's enlightenment and many people visit the temple to pay their respects. They also poured a medicine liquid onto statues of Buddha. The bathing of the Buddha is a major feature of Buddha's birthday celebrations in the city. In Indonesia, Buddha's birthday known as Waisak is a public holiday. A large procession beginning in Mendut in Java ends at Borobudur – the largest Buddhist temple in the world. In Japan, Buddha's birth is also celebrated according to the Buddhist calendar but is not a national holiday. On this day, all temples hold Kanbutsu-e (Japanese: 灌仏会), 降誕会 (Gōtan-e), 仏生会 (Busshō-e), 浴仏会 (Yokubutsu-e), 龍華会 (Ryūge-e), 花会式 (Hana-eshiki) or 花祭(Hana-matsuri, meaning 'Flower Festival'). The first event was held at Asuka-dera in 606. Japanese people pour ama-cha (a beverage prepared from a variety of hydrangea) on small Buddha statues decorated with flowers, as if bathing a newborn baby. In Korea, the birthday of Buddha is celebrated according to the Lunisolar calendar. This day is called 석가탄신일 (Seokga tansinil), meaning "Buddha's birthday" or 부처님 오신 날 (Bucheonim osin nal) meaning "the day when the Buddha came". Lotus lanterns cover the entire temple throughout the month which are often flooded down the street. On the day of Buddha's birth, many temples provide free meals and tea to all visitors. The breakfast and lunch provided are often sanchae bibimbap. In Malaysia, Buddha's birthday known as Wesak Day is a public holiday and is celebrated by the sizeable minority Buddhist population in the country. Temples across the country are decorated and caged animals are set free. People engage in prayers, chanting and giving across the country. In Myanmar, Buddha's birthday known as Full Moon of Kason is a public holiday. It is celebrated by watering the Bodhi tree and chanting. In large pagodas music and dance is also performed as part of the celebrations. Around 2% of the population in the Philippines is Buddhist. Buddha's birthday known locally as Araw ng Bisyak is not a public holiday but is celebrated by the small community of Buddhists in the country. The bathing of the Buddha statue is a significant part of the celebrations in the country. In Singapore, Buddha's birthday known as Vesak or Vesak Day is a public holiday in the country. Buddhist temples hold celebrations and are decorated with Buddhist flags and flowers. Devotees also bring offerings to the temples. In Sri Lanka, Buddha's Birthday known as Vesak is a public holiday and is celebrated on the first full moon day of the month of May. People engage in religious observances and decorate houses and streets with candles and paper lanterns as well as bamboo-framed lanterns. Dansalas is practised and refers to the free offering of food and drink to people. Bakthi Gee – devotional songs are sung and pandols which are decorative gateways are erected throughout the country. Temples around the country also hold celebrations and devotees bring offerings and burn incense. Electric light displays that depict stories from the Buddha's life are also a notable part of Vesak celebrations in the country. In Taiwan, Buddha's birthday is a public holiday. Devotees pour fragrant water over Buddha statues to symbolise the beginning of a fresh start in life. In Thailand, Buddha's birthday known as Visakha Puja is a public holiday. People gather at temples to hear sermons, give donations and chant prayers. Buddha's birthday is celebrated throughout Vietnam. Many Buddhist temples hold celebrations that attract people from around the country and pagodas around the country are decorated. From 1958 to 1975, Lễ Phật Đản, the birthday of Buddha (on the 8th day of the 4th month in the Chinese lunar calendar) was recognized as a national public holiday in South Vietnam, enjoyed with float and lantern parade on the streets. In Sydney, Buddha's birthday is celebrated at the Nan Tien Temple in Wollongong Australia and another celebration also organised by Nan Tien Temple is held at Darling Harbour which features Buddha's birthday ceremony, a variety of vegetarian food and culture stalls and multicultural performances from China, Japan, Vietnam, Korea, India, Malaysia, Sri Lanka, Australia and other cultures. Other temples in the Fo Guang Shan Nan Tien Temple group in Australia on the eighth day of the fourth month of the China lunar calendar also hold celebrations. In Brisbane, Buddha Birth Day Festival is held annually and features a variety of pan-Asian food and performances from multicultural acts. It is a weekend-long festival which draws over 200 000 visitors. In Melbourne, the weekend-long festival called Buddha's Day and Multicultural Festival is held at Federation Square around April/May. In Perth, a two-day celebration also known as Buddha's Day and Multicultural Festival is held at Langley Park. Local Buddhist temples and smaller towns around the country such as Bendigo, Victoria also hold celebrations. On the Australian external territory of Christmas Island, Buddha's Birthday known as "Vesak Day" on the island is celebrated alongside many other celebrations common in Australia and Malaysia as well as local celebrations of the island. In Toronto, a number of Buddhist temples and organisations are involved in an annual event known as Vesak: Buddha's Birthday. It is held at Mississauga Celebration Square and features a number of Buddhist themed events and activities as well as cultural acts from Asia, including China, Sri Lanka and Vietnam. Celebration of Buddha's Birthday in the United States differ from community to community, depending on ethnicity and nationality. The Japanese celebration on 8 April has been significant in the Bay Area for some decades. In 1968 the first circumambulation of Mt. Tamalpais to celebrate Buddha's Birthday was conducted. Starting in 1969 at Tassajara Zen Mountain Center, Hana-Matsuri was celebrated each spring. Dressed in formal black robes, the roughly 70 monks and students formed a formal procession to the Horse Pasture with the leader periodically ringing a small, clear bell. A temporary stone altar was built under a huge oak tree in a gorgeous field of green grass and abundant wildflowers; a small statue of a baby Buddha was placed upon it in a metal basin. Then each person would in turn approach the altar, ladle one thin-lipped bamboo dipperful of sweet green tea over the statue, bow, and walk to one side. In New York, the International Lotus Lantern Parade has been a notable and successful annual event held at Union Square Park. 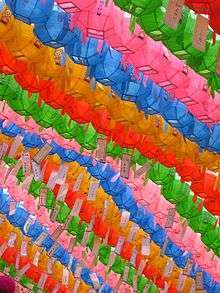 The event celebrates the Buddha's birthday and Yeon Deung Hoe (연등회), a Korean lantern celebration that is held during Vesak. The festival features a number of Buddhist themed events and is started off by numerous Buddhist centres of Japanese, Korean and Sri Lankan origins for example. Bun Festival - a festival held on the same day in Hong Kong. ↑ UNESCO, Lumbini in Nepal is the birthplace of the Lord Buddha, Gethin Foundations, p. 19, which states that in the mid-3rd century BCE the Emperor Ashoka determined that Lumbini was Gautama's birthplace and thus installed a pillar there with the inscription: "... this is where the Buddha, sage of the Śākyas (Śākyamuni), was born." ↑ For instance, Gethin Foundations, p. 14, states: "The earliest Buddhist sources state that the future Buddha was born Siddhārtha Gautama (Pali Siddhattha Gotama), the son of a local chieftain—a rājan—in Kapilavastu (Pali Kapilavatthu) what is now the Indian–Nepalese border." However, Professor Gombrich (Theravāda Buddhism, p. 1) and the old but specialized study by Edward Thomas, The Life of the Buddha, ascribe the name Siattha/fitta to later sources. ↑ Dunipace, Sujal Jane (May 2003). "Nepal's Buddha Jayanti Celebration". ECS Nepal. Retrieved May 9, 2013. ↑ Ko Shu-Ling (May 9, 2011), "Sakyamuni Buddha birthday celebrated", Taipei Times, The legislature approved a proposal in 1999 to designate the birthday of Sakyamuni Buddha — which falls on the eighth day of the fourth month of the lunar calendar — a national holiday and to celebrate the special occasion concurrently with International Mother’s Day, which is celebrated on the second Sunday of May. ↑ "Archived copy". Archived from the original on 11 March 2016. Retrieved 2016-03-11. ↑ "Buddha's Birthday Education Project". International Buddhist Progress Society. Retrieved 12 January 2014. ↑ "Buddha Birthday Festival". Buddha's Light International Association, Chung Tian Temple. Retrieved 26 January 2014. ↑ "Buddha's Birthday and Multicultural Festival". Buddha's Light International Association Victoria. Retrieved 31 March 2014. ↑ "Archived copy". Archived from the original on 14 March 2016. Retrieved 2016-03-06. The Folkloric Study of Chopail (Buddha's Birthday), written by Prof. M.Y.Pyeon. Produced by Minsokwon in Seoul Korea 2002. Wikimedia Commons has media related to Buddha's Birthday.